Feed, Clean and Tend to the Needs of Your Own Pet Alien! It has finally happened. You have made first contact with extraterrestrial life in the form of a sentient blob named Pou. The good news is that Pou is not here to take over the world. He doesn’t even want to be taken to your leader. The bad news is that he can’t really do much of anything; he’s still physically a baby and needs a lot of love and care before he can grow big and strong. That’s where you come in. You need to help raise the little guy. That means feeding him, cleaning him up, tending to his needs, and keeping him happy. Like raising any other pet, it’ll be a lot of hard work. If you keep at it, it will also be a very rewarding experience. Pou may be an alien from another planet, but just like any normal Earthling, he has biological needs too. As his parent and caretaker, it will be your job to nurture him into a healthy and happy blob. Feed Pou a variety of food and snacks, including pizza, ice cream, fruit, pie and so on. Some things are more nutritious than others, but sweets make him happier. Rub your pet down with soap once he gets dirty. 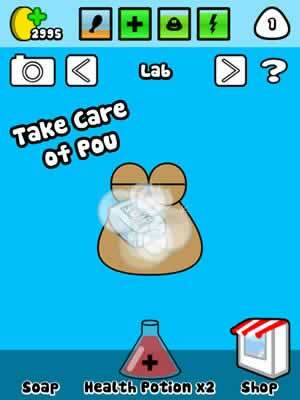 Acquire potions in the laboratory that will have all sorts of special effects when they are consumed by Pou. Shrink him down with the Fat Burner, get him hungry for anything with the Hunger Potion, make him ready to play with the Energizer, and more. Throw a ball around to improve Pou’s mood if he’s feeling cranky or under the weather. Let Pou get some much-needed rest in the bedroom. Watch Pou gain experience and grow over time. As you take care of him, you’ll find that the slimy little rascal can be a real handful. Besides feeding him, there are a variety of games you can play just to mix things up. These games are not only fun, but they keep Pou happy and get him some much needed exercise. Play Food Drop. Help Pou catch and eat the edible stuff while staying away from the garbage. Play Pou Sounds. Test your memory by playing back the correct combination of sounds you hear in a game reminiscent to Simon. Play Tic Tac Pou and get three in a row. In Sky Jump, tilt your device to guide the bouncing Pou higher up the cloud platforms. In Free Fall, help Pou collect as many coins as possible as he falls freely in the sky. Play Color Match. Shift the rows of multicolored Pou blobs around to match at least three together. You would think that there aren’t a whole lot of ways to give a blob style, but Pou will surprise you once again. There are a great many ways to give Pou a look so unique, that you would have no problems picking him out from a crowd of other Pous. Collect an entire wardrobe of clothing and accessories. Dress Pou up in a nice assortment of suits, hats, glasses and jewels. Put on a different wallpaper pattern for every individual room in Pou’s virtual home. 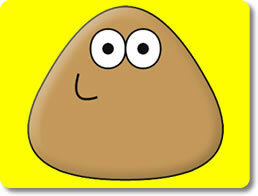 Change the color of Pou’s body to whatever you like. Can You Love an Alien Blob? Pou may be a shapeless blot of slime, but the little guy has got a whole lot of charm in him that it’s hard not to love him. He gets excited about playing games, can be a little stubborn about eating his vegetables, and will become sad if he’s feeling neglected. If that sounds like the kind of thing you could see yourself taking care of from the comfort of a smartphone, then you owe it to yourself to download Pou right away. There’s no reason to wait! The game is completely free and our slimy friend is looking for a good home. When you hear the word "Pou," it probably brings to mind something of a scatological nature. That likely won't change when you take a look at the titular creature himself, who's little more than a pile of living goop. Fortunately, despite those hopefully unintentional innuendos, Pou has little to do with actual toilet humor. Half virtual pet and half minigame compilation, Pou is certainly not lacking in variety. No matter what kind of person you are, the app should have something that you can glean some enjoyment out of. However, while the game aims to please as many people as possible, its presentation will likely be an automatic turnoff for a lot of prospective gamers. If you're one of those that can stick with it, then you'll probably have a decent amount of fun. That's all you're going to get. The first thing you'll notice about the Pou app is that it's not much to look at. It's not ugly by any stretch of the imagination, but the visuals don't exactly showcase a whole lot of inspiration or personality. Pou looks like your basic Flash game with all that entails: two-dimensional graphics and bright colors. Most everything looks like how it should; potions bottles look like potion bottles, soap looks like soap, food looks edible, and so on. You won't get lost, but it's unlikely that anything about the visuals will stick with you. However, the backgrounds are even less imaginative. In fact, calling them backgrounds is being generous. They're really more like blank spaces of color. Pou supposedly takes place inside a house with different rooms that have their own furnishings, but you wouldn't know that just by looking at them. The bedroom is a greenish-yellow screen, the bathroom is blue, the kitchen is pink, and so on. You can alter the backgrounds to have different colors, but that's no replacement for illustrated scenery. The game most certainly could have afforded a little more creativity in this area. Pou himself may very well be a divisive figure. There's not a whole lot to say about a formless blob with a face and a squeaky voice. The developers have done what they could to inject the little guy with a personality, though their efforts aren't always successful. Pou gets happy and excited when you bounce a ball around, looks quite miserable when he gets sick, and so on. However, it really comes across as soulless and by-the-numbers. He's not nearly as expressive as a lot of other cute critters in the mobile gaming scene are, and his basic design isn't much to talk about anyway, though your mileage may vary. Some people might find him to be cute as he is, while others will inevitably see the little alien as annoying. Whatever you think of Pou just by seeing a screenshot of him is unlikely to change once you see him in motion. You would think that you'd need to resort to some outrageous techniques to feed and care for a pet amorphous blob. You would be wrong. Despite his strange biology, the virtual pet portion of the game is really nothing outside of the ordinary for the genre. You feed Pou when he's hungry, you bathe him when he's dirty, and you let him rest to regain his energy. You also have to clean up his poop, which has some disturbing implications as the waste itself is shown to have eyes. Regardless, the touchscreen controls are generally responsive, making everything easy to pull off. If there is one original thing to say about the game, it would be the laboratory. It's this room where you can acquire potions. While a lot of these have pretty typical functions, such as curing Pou of illness, others bring about more amusing effects on the little guy. Some potions help him burn weight, while others effectively bulk him up and make him hungry for fatty food. If you have some extra coins on hand, potions can be pretty fun to fool around with. Perhaps what's more impressive about Pou are the ways that you can alter his appearance. The game features a wide variety of clothing and accessories to doll him up in. There are shirts, dresses, hats, glasses and other odds and ends like rabbit ears. It's a mystery how a boneless ball of slime can wear anything, but just roll with it. If anything about the virtual pet portion of the game is going to keep you engaged, it will be in collecting as many accessories as you can. Nothing is free in Pou. If you don't want to cough up the money yourself to buy Pou food, clothing and potions, then you have to earn them through the myriad of minigames that come packaged with Pou. There's not an original one in the bunch, but it's nice to have so many in one place. 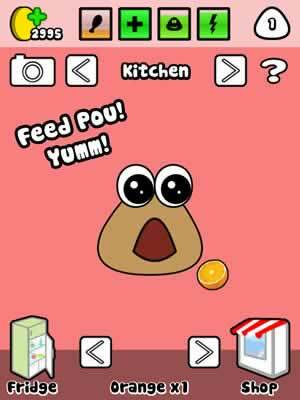 In Food Drop, you try and have Pou eat all the food falling down from the screen while avoiding the inedible stuff. In Pou Sounds, you play a knockoff of Simon by tapping the Pous in the exact same order they squeak in. Sky Jump is effectively a Pou-themed rip-off of Doodle Jump where you guide a bouncing Pou up a never-ending series of platforms. This is only a small sampling of the games that are available. While the games may look and sound derivative, they can still be pretty fun and addictive. You're free to play whatever games you like, and can safely ignore the ones you don't. Pou never forces you into anything. Skillful play rewards you with additional coins, so you'll want to do your best since playtime is somewhat gated. Your pet blob sadly has limited bundles of energy at his disposal. When they're depleted, he needs to rest and recuperate. This can be annoying if you just want to kill time playing your favorite activity, though if you've been with the mobile gaming scene for this long, then you should also know that this is pretty typical. At the end of the day, while Pou is not stellar at what it does, it is competent. The minigames aren't original, but they're numerous and fun. The virtual pet is cliché, but everything about it works as intended. The clothes you can dress him up in and the potions you can pour down his throat may be gimmicky, but they can still bring a smile to your face. All that remains to be seen is just what Pou the character can do for you. A lot of older gamers might be turned off by his appearance, but children are more likely to find his antics endearing. There are certainly more attractive pet simulators to find, but Pou is a pretty safe download as it is that still might worm its way into your heart. At the very least, the app's impressive compilation of minigames can help you test the waters for all the various mobile puzzle games out there.